Before mussels sit steaming in your plate at table, a lot of work has been carried out. The natural raw material is the seed mussel. The main annual ‘planting’ takes place in April and May. 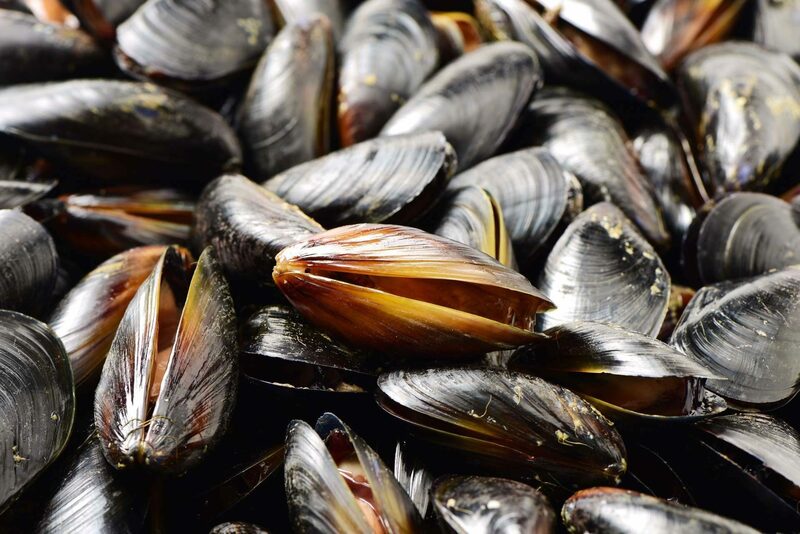 The mussel larvae drift around freely at first, and then when they become seed mussels they cling to anything they can find and they drift together with the movement of the currents. They amass and form whole mats that cover the sea floor. The harvesting of the seed mussels takes place in the Waddenzee and the waters of the Zeeuw. They are fished with nets and deposited in thin layers at special locations. The seed mussels are left to grow here into ‘half-grown mussels” measuring 4 to 5 cm. After a certain time they are fished again and deposited at plankton-rich beds. After about two years the mussels, which are now 6 to 7 cm long and ready for eating, are fished again. When fishing the fully-grown mussels at the mussel beds, they often get a lot of sand and silt in the shells. To enable them to eliminate the sand the mussels are taken to a protected place in the Eastern Scheldt, these are so-called “freshwater beds”. They are left here for a while so that they can eliminate any sand. The mussels are deposited at high tide and carefully laid out by hand at low tide. Because they get sand in them when they are being fished for the last time they are sprayed clean and packed in jute sacks and then transported in refrigerated lorries.